In my childhood August a month before the school started and a month when an old pear tree in my grandparents’ garden was ready to share with us the best pears I’ve ever eaten in my life. I was too little to think of such things as variety so all I can remember now: it resembled Comice pear – green-yellow with an occasional red blush. The tree was tall, with a lot of branches. Low hanging fruits … were allowed to ripe on the tree. Whenever I felt like it I could go there and choose which one I wanted to eat. Pears that grew higher on the tree would be usually picked slightly immature and left to ripen in the summerhouse. My Grandfather had built it himself and I loved spending time in it – playing when I was younger or reading when I got older. A wonderful smell of dozens ripening pears accompanied me in those hot summer days when tired of running around in the sun I would resort to the shade of the summerhouse. 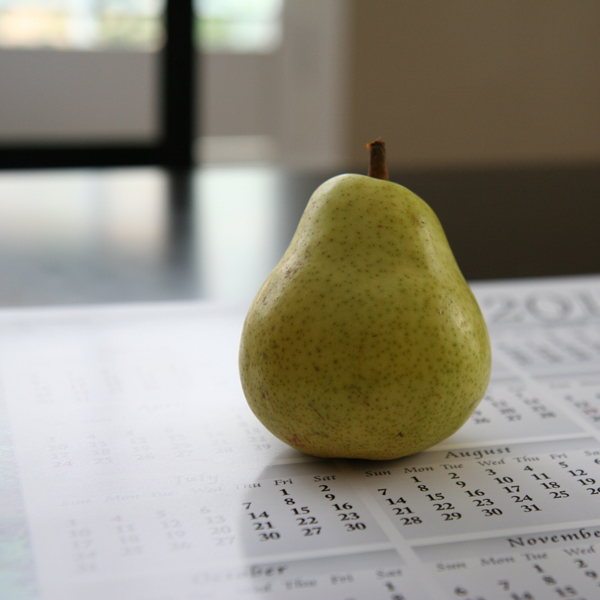 Unlike mimosa, linden or lilac – all scents which I always loved and wanted to wear as a perfume, I’ve never considered pear to be a wearable scent. I like eating them in the season, don’t miss them off-season and definitely don’t want to smell of them. I like Petite Cherie by Annick Goutal – created in 1998, notes include pear, peach, musky rose, fresh-cut grass, vanilla. But I wore it for years before I learned it had a pear note. Even after that I thought I couldn’t smell a pear note. I tried to describe how Petite Cherie smelled and I couldn’t. I can’t come up with words to represent what I smell and the scent doesn’t remind me of anything else so I can’t even offer an association. I do not have any special memories connected to Petite Cherie, so probably I really just enjoy the scent. If you’ve tried it you know how it smells and if you haven’t – try because whatever description you’ll read will not give you the right picture of what to expect from this perfume. For years I thought of it as of a universal darling but recently I met a couple of people who, to my surprise, found this perfume to be unpleasant. I wore it again while working on this post and I still love it. Deep Red by Hugo Boss – created in 2001 by Alain Astori and Beatrice Piquet, notes include black currant, pear, tangerine, blood orange, ginger leaves, freesia, hibiscus, sandalwood, Californian cedar, vanilla and musk (fragrantica.com). This is one of my favorite perfumes from my pre-perfumista period of life. I know Perfumeland’s attitude towards that brand. I realize that it probably isn’t that great and stands out both in this post and in my current collection. And I do not care: I liked Deep Red for many years; I went through two bottles of it and still have some juice left in the third one; and I still enjoy wearing it. English Pear & Freesia by Jo Malone – created in 2010 by Christine Nagel, notes include pear, freesia, rose, amber, patchouli and woods (from jomalone.com; other sources mention quince, rhubarb and white musk). Sweet, almost gourmand but not quite because of the strong floral component. It’s a bright and warm scent but at the same time it maintains transparency usual to Malone’s colognes. It doesn’t develop much on the skin (as most of other perfumes in this line) but if you like what you smell it’ll stay with you for hours. I got a small decant of English Pear & Freesia from a co-worker and I will buy a bottle once it’s gone. La Belle Hélène by Parfums MDCI – created in 2010 by Bertrand Duchaufour, notes include pear accord, aldehydes, tangerine, lime blossom, rose essence, osmanthus absolute, ylang-ylang Madagascar, orris butter, hawthorn, Mirabelle plum, myrrh, vetiver Haiti, patchouli, cedar Virginia, amber, oak moss absolute, white musks, sandalwood, licorice wood (luckyscent). It’s a true gourmand scent, sweet but with some dirty note in the drydown. For me La Belle Hélène smells not like a pear fruit but like a pear tart (love those). It’s much more complex than English Pear & Freesia. I got my sample from a draw at Persolaise – A Perfumer’s Blog. I like how it smells and develops on my skin but I’m not sure if I want to wear it as a perfume. The price is also a stopping point. So when I’m done with the sample I won’t probably be seeking even a decant (read the review that inspired me to test this perfume again recently). What is your perfect pear? 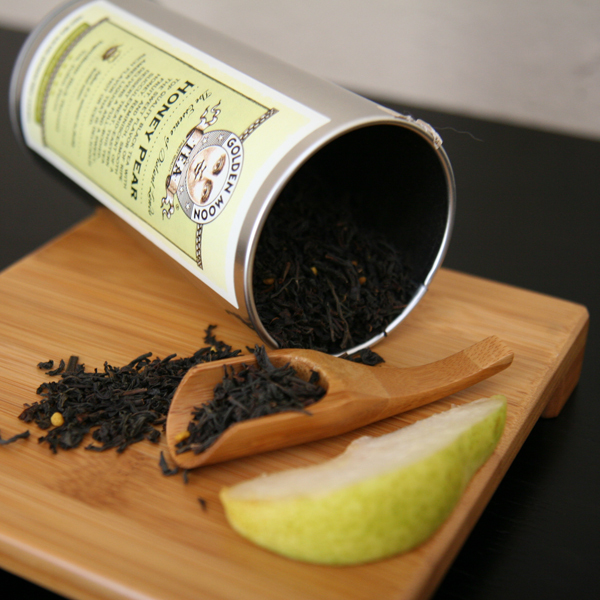 Mine – Honey Pear by Golden Moon Tea. This entry was posted in Favorite Perfumes, Not a Review, Single Note Exploration, Tea Party and tagged Alain Astori, Annick Goutal, Beatrice Piquet, Bertrand Duchaufour, Christine Nagel, Deep Red, English Pear & Freesia, Golden Moon Tea, Honey Pear, Hugo Boss, Jo Malone, L'Artisan Parfumeur, La Belle Hélène, Mon Numéro 1, Parfums MDCI, pear, Petite Cherie. Bookmark the permalink. I don’t have a pear perfume. At all. :) And haven’t smelled any of those on your list, although I would like to try Belle Helene, Jo Malone English Pear and Mon Numero 1. Out of those three English Pear is probably the easiest to try and to get (it’s probably the least expensive and there is a 30 ml bottle). Do you have JM counters anywhere close to where you live? Oops, I only now saw the reply. Undina, when I was in Sweden two summers ago, I smelled a mesmerizing perfume on a woman who was dining at a table close to us. It was a cool evening and we were dining outside and a light sea breeze kept stirring her scent our way; it smelled divinely jammy and oriental. Finally I worked up the nerve to ask her what it was, and Hugo Boss Deep Red was her reply. I can understand why you love it. Mon Numero 1 is definitely a favorite. I know there are many people who hate the current Piguet Visa, but I like it — especially the pretty pear note that it has in the top notes stage. I will wear Mon Numero 1 once or twice more (while my sample lasts) but it’s not love for me. Who knows, I might change my mind next summer. I will try to find Piguet Visa – I’m curious. Yeah, now I remember: I called her Dee the Lemming Slayer. Now I’m conflicted… I am curious about this scent but, most likely, I won’t like it. We’ll see. I have the same problem as you. I love pear but where do I find a good one? I haven’t tried Montale Wild Pear yet. Maybe it is worth it. Sometimes the search is even better than the final result. And in case with pear it might be especially so: since it’s unlikely anybody will create a pear “soliflore” (which is completely feasible with flowers), all perfumes you try on your journey are more or less complex combinations with a pear accord/note – so possibilities are endless! 2. Kiehl’s perfume oil Pear: this one i liked the most, because is really well crafted and so close to the real smell of this fruit!… Relatively longlasting to. Thank you, efi. I was not familiar with any of these two, so I looked them up. The one by Fresh is discontinued so I’ll probably skip it. But Kiehl’s one is still in production so I’ll stop by the Kieh’s counter at Nordstrom to see if they have it. I’ve never thought of this brand as of a perfume producers. Pear is not something I have ever thought of for a perfume. But reading your post I got a scent memory of canned pears and could see it with maybe some spice, ginger and vanilla. I’m not really into gourmand’s but I can see how this would work. Of course, I’m partially joking but beeing originally a floral perfumes lover I found recently that in some situations gourmand scents were much more appropriate and corresponded better to how I felt. I wish you to find your purfect gourmand perfume. As time goes on, I am seeing more similarities between our tastes. And we already discovered our shared history with Deep Red via the Candy Perfume Boy’s post. I need to find a bottle and see if I still like it, as it has been a while. I have never identified Pear specifically as a note I like, but now you have got me thinking that maybe it is. I love pears, that’s for sure! And, I also like Piguet Visa which Suzanne suggested. If by the next time I send you anything you won’t find it, I’ll send you some. It can be bought for a very reasonable price online (as a FB) but I’m not sure if anybody still caries it in a store. Like you, I’ve never particularly wanted to smell of pears and I currently don’t have a favourite pear perfume. Similarly though, I also became very interested in La Belle Hélène by Parfums MDCI after Birgit’s wonderful review. Pear tart – yummy! Now I want to try Hugo Boss Deep Red which is not something I thought would ever happen, but that’s what’s great about our perfume blog world. As I told APB above, let me know if you cannot easily get to try Deep Red – I’ll send you some the next time. Your childhood memories of ripening pears brought back my own. For two winters, we lived on my grandparents’ Michigan farm. I can’t remember what kind of pears we ate in the fall time, so juicy and sweet. Then we picked the winter pears and kept them in a room to ripen. Lovely, lovely! Lucy, I’m glad that my memories evoked yours. Thank you for sharing. ooh – I’m glad to see a mention of Deep Red. I wanted to get my sister a perfume and asked her to go to the mall- sniff all the perfumes and tell me which she liked. She said she loved Deep Red (she doesn’t have access to niche perfume stores). In addition to Deep Red, I wanted to buy her something niche based on this choice that I thought she might love and bought her Ormonde Jayne’s Taif. ANy other suggestions of what she might like? I actually think she might like one of the lighter variations of Shalimar (since Deep Red also has that vanilla thing happening). I was actually very excited that she liked something rich and oriental- I thought she might like more the fresher cleaner kind of scents..
Lavanya, I don’t know how niche you want to go… Let me suggest a couple of perfumes, based not on the experience but rather on the lack thereof. In addition to liking Deep Red and loving Ta’if, my recent new favorites were Heure Exquise by Annick Goutal, Bois des Iles by Chanel and Rose 31 by Le Labo (I didn’t include any from Amouage, By Kilian or Frederic Malle – just for the price reason). Thanks Undina! I don’t really have to go niche- I wanted to introduce her to perfumes that she may not be able to access..
You know, I think she might really like Bois des Iles- I will send her a sample (I remember her liking Chanel no. 5 sometime back..Oh she also liked Poison though she thought it too strong). Thanks for the suggestions Undina! I must sniff Heure Exquise. (and re-sniff Rose 31- I really liked when I smelled it a few years ago). That’s not the perfect pear either, but I find it comforting to wear in bed sometimes, and occasionally out! Have you tried Deep Red shower gel? I think it’s great. Not worth paying the full retail price but if you can buy it from a discounter – go for it! The shower gel? No indeed – didn’t know there was one. Will keep my eye out! I’m not sure I’ve ever tried Visa (I’m traumatized by his Fracas) but if I come across it at some point I’ll give it a try – thank you for the idea, Ellia. I finished my (2nd? 3d?) bottle of Deep Red and got a partial bottle from a parfumista friend who decided she wouldn’t be wearing it any more.